Former residence of the kings of Castile and Spain; noteworthy for the numerous assemblies of the Cortes which were held there and which passed anti-Jewish laws. The city had a large Jewish community, which, together with the Jews of the neighboring towns of Zaratan, Portillo, Cigales, and Mucientes, paid 69,520 maravedis in taxes in the year 1290. Ferdinand IV., in opposition to the wishes of the town council, granted the Jews of Valladolid special privileges; but in the civil war between Pedro I. and Henry of Trastamara the inhabitants of the town rebelled against the king and supported D. Henry, taking advantage of this occasion to plunder and destroy the houses of the Jews and their eight synagogues, robbing the latter of their ornaments, and tearing the scrolls of the Law. Toward the end of the year 1411 Vicente Ferrer resided at Valladolid, and, not content with the results obtained from his sermons, induced the town council to confine the Jews within their circumscribed ghetto. In May, 1432, the great synod, composed of representatives of the different communities and of other influential men, held its sessions in the large synagogue in the Jewish quarter under the presidency of the court rabbi Abraham Benveniste. As in other places in Spain, during the year 1473 and in the following year many Jews who had renounced their religion were burned at the stake in Valladolid. The Jews of the city were so few that they, together with their coreligionists in the towns mentioned above, paid only 5,500 maravedis in taxes. At the time of Asher ben Jehiel, Moses ben Ḥabib was rabbi in Valladolid, which was also the birth-place of the convert Abner of Burgos or Alfonso de Valladolid (Asher b. Jehiel, Responsa, § 107, No. 6). A few months before the expulsion, D. Abraham, physician in ordinary to D. Pedro Gonzalez de Mendoza, Primate of Spain, accepted baptism, as did also D. Abraham Senior and his two sons. Valladolid was the seat of a tribunal of the Inquisition, which held many autos da fé there. See Benveniste; Inquisition; Senior, Abraham. Shebeṭ Yehudah, ed. Wiener, p. 133. 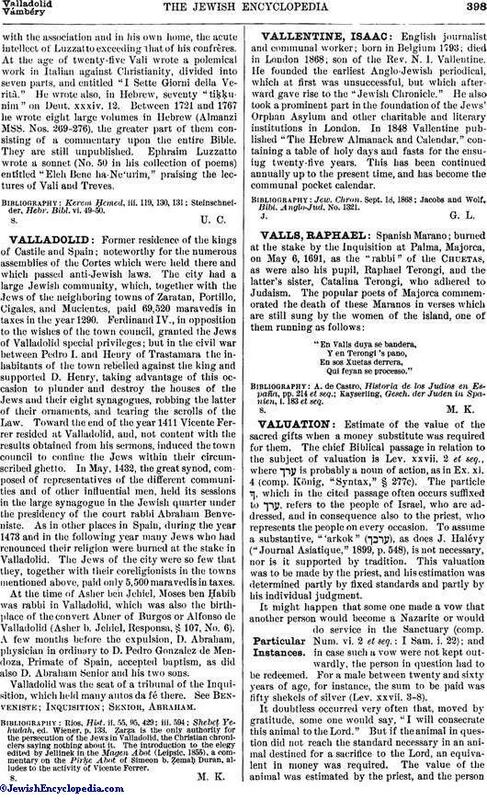 Ẓarẓa is the only authority for the persecution of the Jews in Valladolid, the Christian chroniclers saying nothing about it. The introduction to the elegy edited by Jellinek in the Magen Abot (Leipsic, 1855), a commentary on the Pirḳe Abot of Simeon b. Ẓemaḥ Duran, alludes to the activity of Vicente Ferrer.